Letterpress is an enjoyable and rewarding print technique with an incredible 500 years of history behind it! The technique of using movable type was first introduced in the west in the 15th century by Johannes Gutenberg. The process developed over the centuries, notably in the industrial revolution, and creating a revolution itself in mass distribution of the printed word. With the advent of modern offset lithography, the art of letterpress was almost consigned to the history books, until a relatively recent revival found artists and designers craving the tactile and hands-on characteristics of the process, which we enjoy today. Did you know that the impression desired by letterpress enthusiasts today was frowned upon in the heyday of letterpress? The true printer spent years seeking to achieve a smooth, kiss impression! This small press was marketed to appeal to the widest audience, from hobbyist to small businesses. The design was patented for the Model Press in America in 1874 by William Clark and Joshua Daughaday and Carlo Giuseppe Squintani took the British patent out on 10 April 1877. Squintani started selling the presses from the summer of 1877 but it's not known whether these first presses were manufactured in the UK or imported. 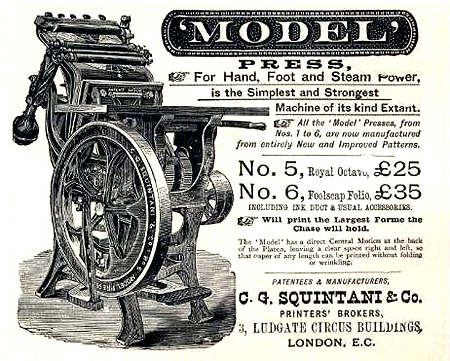 By 1888 Squintani's adverts claimed the presses were made by a high-quality engineer in London. The presses were available in a variety of sizes from the No. 0 to the treadle-driven No. 6 Job. The American and French numbering system for model presses differed from the UK versions and the table below shows the key sizes. In common with Adana, Squintani sold complete outfits including the press, type and ink from their showrooms in Farringdon, London. The Model Press was sold for nearly a hundred years but the appeal of the Adana appears to have eclipsed it, despite the Model being a sturdier built press. * Weights from John Ryder's Printing for Pleasure. WE Cook advertised the 'Improved Model' press between 1898 and 1900 in only one size: an 11" x 5" treadle platen. Information taken from The British Letterpress, kindly supplied by Toby Hardwick and Nick Smith. We currently run four hand-fed presses with a fifth, the motorised TP48, earmarked for restoration. Manufacturer: C.G. Squintani & Co. Details: This is a jobbing press. It’s a large clamshell platen with a revolving plate and fly wheel. More information here. Details: A table top platen press is a traditional, transportable teaching press, and is a favourite of hobby printers because of its size. Details: A proofing press does exactly what it says on the tin - it's ideal for proofing a forme before printing on a larger jobbing press. It is also great for poster work because of the large bed. Chase (Print) size: 7" x 11"